TerraVac Vacuum Excavation utilises innovative vacuum excavation technology to provide WA with safe and efficient, non-destructive, none invasive excavation and underground utility location services. 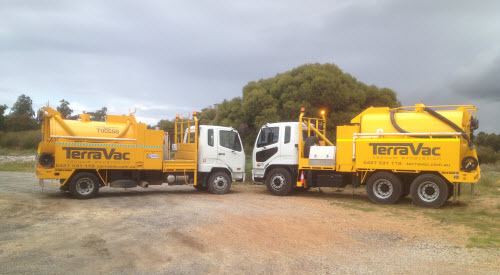 TerraVac Vacuum Excavation is a fully Western Australian family owned and operated company, established in 2009 to service WA. With Australian designed and built Vacuum Excavation units, our trained and experienced operators are dedicated to providing WA with safe, non-destructive means of excavation and the protection of underground assets and infrastructure. Our powerful, versatile units are available for Wet Hire with fully trained and resourceful operators to optimise overall efficiency. Specialising in trenching and open hole type excavations, the uses of a Vacuum Excavation unit are many and varied - limited only by your imagination! Please see Our Services Page for more information! TerraVac Vacuum Excavation is quick, safe and accurate, decreasing overall costs and turnaround time! Why Choose TerraVac Vacuum Excavation? TerraVac Vacuum Excavation eliminates putting lives and assets at risk when excavating.